Traced from seaward to landward the coastline of Abu Dhabi consists of a complex of barrier islands and tidal deltas, lagoons and tidal flats and the entire province is constant evolving. 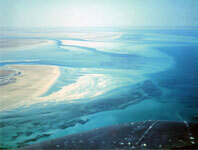 The barrier islands east of Al Dhabaiya lie close together and are separated by narrow tidal channels and deltas. These islands are "T" shaped, with the top of the "T"s lying seaward and parallel to the trend of the coast and at right angles to the dominant wind direction (Evans et al. 1964a, b). Here oolites accumulate on the higher energy inter island ebb tidal deltas, while coral reefs are restricted to small patches seaward of the islands between them and along the tidal channels (Evans et al. 1964a, b). carbonate muds and pellets collect south of the barrier in the protected lagoons. The elongate stems of the islands separate these lagoons. Tidal movement within these lagoons tends to be at right angles to the coast. West of Al Dhabaiya Island, the protecting barrier islands are more widely separated from each other than those to the east. They occur on extensive sandy shoals and coral banks cut by tidal channels. 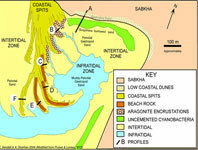 carbonate muds accumulate only in a narrow belt south of the offshore bank and grapestones and skeletal debris are the dominant sediment components (Kendall & Skipwith 1968). 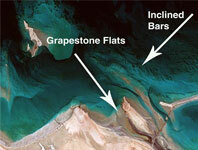 The Khor al Bazam lagoon south of the barrier is a continuous open body of water. It has less restricted circulation than the lagoons to the northeast and its western end is connected to the Arabian Gulf. At the west end it reaches 20 m of depth. Eastward, the lagoon shallows, so that south of the island of Abu al Abayad, it is intertidal, and the circulation of the tidal waters becomes restricted. 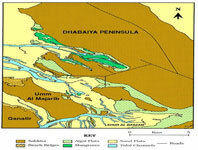 The dominant tidal movement in the Khor al Bazam is east west. 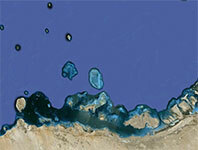 North of the Khor al Bazam coral reefs rim the northern flanks of most of the offshore banks. 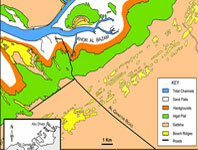 South of the bank and the Khor al Bazam, in the protected waters of the eastern lagoon, supratidal flats are encroaching northward into the lagoon through the development of beach ridges and cyanobacterial flats accumulation. The situation is similar to south of the Abu Dhabi lagoons; here maximum protection from the dominant north northwest wind has enabled extensive cyanobacterial flats to form, accreting northward in the intertidal zone. 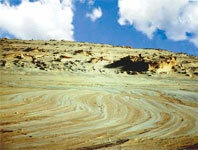 These flats are flanked by the supratidal "sabkha" (Evans et al. 1964a, b) without any break in slope. In contrast, along the more exposed coasts of the western Khor al Bazam, small beach ridges are common at the landward edge of the intertidal platform. Here the beaches on the islands are protected from waves by broad coral reefs and shoals, forming wide frontal intertidal flats that are backed by small subaerial dunes 1 to 2 m in height. Differences in exposure to waves are reflected in the barrier islands to the east too. 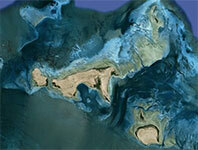 Thus the islands around Abu Dhabi are positioned on a narrow shelf with little protection from heavy seas. Before the now extensive industrial development of this coastline these easternmost islands developed steep beach faces, landward of which large subaerial dunes with heights greater than 5 m once formed.